A friend of mine sent me this video and I couldn’t wait to share it with you. I thought it was one of the most beautiful things I’ve ever seen. Turn your speakers up and take a moment to truly absorb it. It is a 3 minute video clip of the full moon rising over Wellington, New Zealand. It was shot 2 nights ago, on a calm summer evening, as people gathered on the Mt. Victoria Lookout point to watch the moon rise. 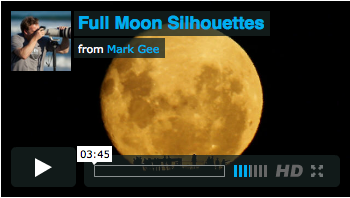 Full Moon Silhouettes is a real time video of the moon rising over the Mount Victoria Lookout in Wellington, New Zealand. People had gathered up there this night to get the best view possible of the moon rising. I captured the video from 2.1km away on the other side of the city. It’s something that I’ve been wanting to photograph for a long time now, and a lot of planning and failed attempts had taken place. Finally, during moon rise on the 28th January 2013, everything fell into place and I got my footage. This is beautiful, Joeaux! I awoke this morning with a feeling of inexplicable sadness; watching this brought a smile to my face and joy to my heart! TRULY beautiful! Thanks for sharing this beautiful piece of filming! Love the people walking around in front of the moon!